Are chemicals safe and effective for removing tree stumps in Colorado? You are here: Home / Stump Grinding Blog / Tree Stump Removal / Are chemicals safe and effective for removing tree stumps in Colorado? Obviously, as a stump removal company, we always prefer to grind a stump into mulch in a few minutes, clean up the mess, and leave with our customers smiling! But there are some applications where it may be appropriate to consider other options. People often ask if chemical stump removal treatments are safe and effective. The answer in Colorado is kinda, and kinda. Chemical treatments are meant to“accelerate decomposition” of a stump, assisting the breakdown of the wooden heart of the stump. 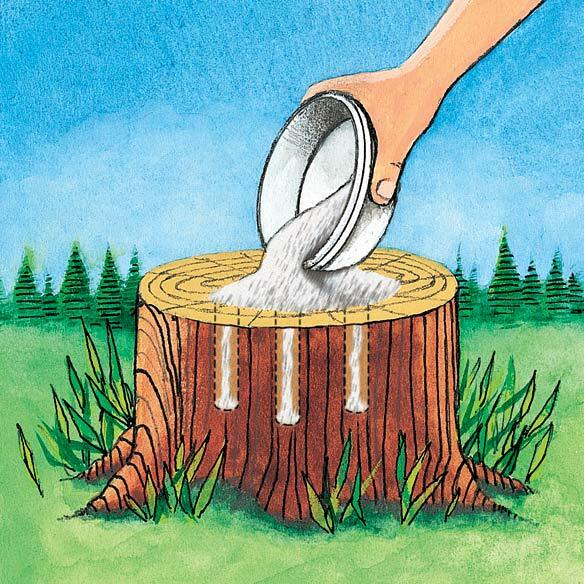 This is accomplished by applying a chemical stump killer if the stump is from a newly cut tree, then waiting a week or more for the chemical to work. Next, drill numerous 1 inch holes about 12 inches deep into the stump, dump the decomposing chemical (usually potassium nitrate granules) into the holes, then fill the holes with water. Wait 6-8 weeks, at which point your stump is supposed to be be soft and ready for you to “break apart.” Finally, spend a weekend “breaking apart” the stump with an axe, hatchets, hand saws, etc. The problem is that in the dry, arid, high desert climate of Denver and Boulder and the rest of the front range of Colorado, decomposition takes a long time! If you take a trip up to Central City, Blackhawk or Idaho Springs area, you will see stumps that were cut down in the 1890’s mining boom that are still intact. For live trees or long-dead stumps, when chemicals are added to the stump, due to our dry climate, the woody heart of the stump often remains whole. In fact, 30-50% of the stumps I remove are stumps that have been previously (unsuccessfully) treated with chemicals. The other claim is that these chemicals “will not harm surrounding vegetation.” While this is technically true (with the keyword being “surrounding”) potassium nitrate is a salt, and high concentrations of salt prevent future growth where the stump was treated. If the salt leeches out and builds up in the ground, nearby vegetation dies, and revegetation becomes impossible until the salted ground is removed. On the back of the chemical packet, there is also a warning to keep your pets and children away from the area, which speaks for itself. Low cost – about $6-$10 for the remover chemical, $19 for stump killer if needed. Often ineffective in Colorado, leaving most of the stump too intact to remove with hand tools. Contaminates the ground where the stump was with salt, preventing future growth, making revegetation impossible. The entire process is very slow – weeks or months, often multiple treatments. It ends with the strenuous work of breaking apart the stump. Best for time flexible, cost sensitive applications where overall aesthetic outcome is not critical and impact on surrounding or future landscape is of low consequence.